[THOMAS JEFFERSON, WILLIAM CRANCH]. Pamphlet. 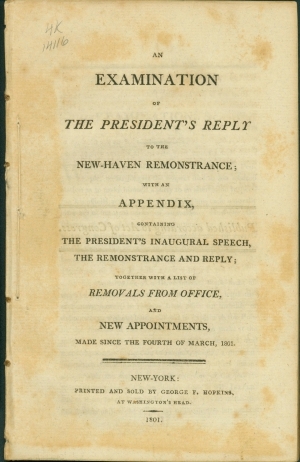 An Examination of The President’s Reply to the New-Haven Remonstrance; with …the President’s Inaugural Speech, The Remonstrance and Reply … a List of Removals from Office and New Appointments. 1801. New York: George F. Hopkins. FIRST EDITION. Octavo. 69pp. Jefferson’s ascension to the presidency in 1801 marked the first time in American history that power was transferred from one political party to another. The peaceful transition removed fears of a counterrevolution, a welcome reassurance after the rancorous, drawn-out election of 1800. Jefferson’s first “Inaugural Address” (which is printed in this pamphlet), with its famous call to unity (“We are all Federalists; We are all Republicans”); was received with some optimism, though many Federalists remained skeptical. One of the earliest actions of his administration seemed to bear out the Federalist’s cynicism. Reacting against the Federalist bias of Adams and Washington in appointing federal officers, Jefferson began replacing Federalist appointees with his own Republican nominees. Jefferson was thorough in this process, replacing officers even in comparatively humble positions. One of the men removed by his administration was a popular customs official, Elizur Goodrich, at the port of New Haven. The reaction of the city’s merchants was swift but respectful. Presuming, at least on paper, Jefferson’s ignorance of local circumstances, they requested Goodrich’s reinstatement. Jefferson’s somewhat patronizing reply, which denied the merchant’s request while developing a reply that seemed to presume their ignorance of constitutional matters, was criticized by both Federalists and some Republicans, who lamented what they saw as Jefferson’s betrayal of his principles.